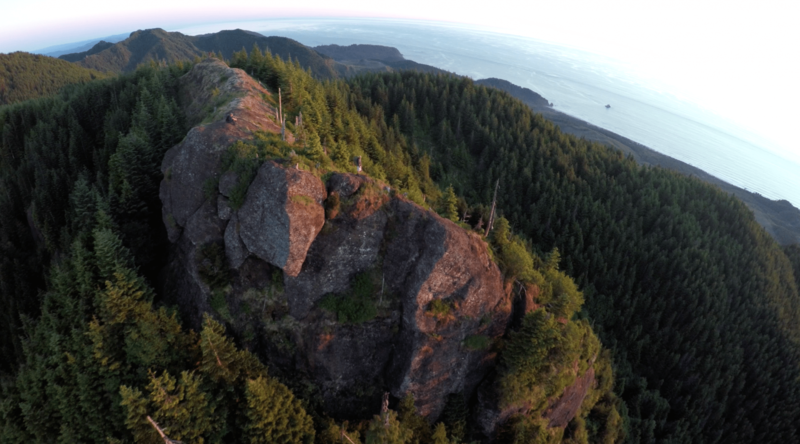 The Morrisey Productions crew backpacked up to an unnamed “Mystery Peak” in the Oregon Coast Range to film some amazing aerial drone footage. We are producing an Oregon Adventure video that will feature the most scenic sites in Oregon filmed entirely with a DJI Phantom Drone. Aerial videography gives the viewer a new and unique perspective that has never been seen before on film. I want to thank our cousin Willy Weaver from Southern Oregon for helping us carry all the gear up the mountain for this video shoot. The peak you see in the video is called Mystery Peak but we call it Sligs Peak after our good friend Chad Higgins from Cannon Beach pushed us hard to bushwhack through the woods and discover the summit. I have done a lot of backpacking but this place is still one of my favorite. The Morrisey Productions crew backpacked into this area about 2 years ago for a photography shoot before we had the DJI Phantom Drone. From the looks of the place and the “sign” on the trail it doesn’t look like it has had much traffic since. This clip was filmed with our DJI Phantom Drone which has been fully upgraded for video production. The camera we were using is a Hero 4 Back with 4k recording capabilities. As the DJI Drone gets higher in the air you can see the ocean to the west and the Coast Range Mountains to the South and East. As you can see from the video our camera work with the drone is flawless. This is a great clip, but we had so many good ones this didn’t make the final cut. I love how Brit rotates the drone around us as he climbs higher into the air. The full Oregon Adventure Video filmed 100% with a aerial vehicle will be released in late summer of 2015. Subscribe to us on social media to see more aerial videos that didn’t make the final cut. We are also entertaining sponsorship opportunities for company’s and quality outdoor products. Contact us at the Morrisey Video Production for more information.